If a little kid asked us for .25 so he could buy a Toy Bot capsule toy, we'd say no. If he cried, we'd laugh. Toy Boy Diaries has been around since the iPhone's App Store released July 11 and it's received great reviews from gamers praising its attractive graphics, adorable protagonist and unique control scheme. To that we say, at least they got two out of three. Although we agree that the cute Toy Bot makes for a great character and the visuals are nice, the game's controls are much too frustrating. As Tiny Toy Bot, it's up to you to solve a bunch of physics based puzzles and retrieve lost data pads to recover his memory. To do this, you'll make use of the iPhone's accelerometer and touch screen controls, though the mechanics don't work as well as we'd hoped. Moving left and right by tilting the phone in the desired direction is all right, save for Toy Bot moving too slow; seriously, the dude needs a jetpack. Other functions, however, drive us crazy; in particular, the grapple beam, a bolt of electricity that allows you to grab onto things and swing by moving the phone back and forth. Novel concept, but you can't grab everything, and figuring out how to swing and nail the timing so you can launch Toy Bot to higher platforms takes a lot of practice, except in this case, we didn't feel like investing the time. Some games have a learning curve and we get it, but Toy Bot Diaries is so slow and methodical that after 20 minutes of trying to whip Toy Bot onto a ledge we had to shake the sleep from our heads. That being said, this game isn't Sonic the Hedgehog and it's not supposed to be. 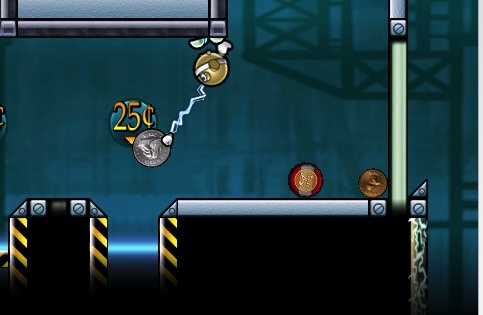 It's a more cerebral platform adventure where racing for the finish line takes a back seat to figuring out brain teasers that require you to open doors, drop coins into bottomless pits and fly through the air after building momentum. To that end, we're sure some gamers will love Toy Bot Diaries for its cool music, light-hearted hero and intriguing puzzles, but we couldn't connect with it. Publisher IUGO Mobile Entertainment has some good ideas, and a sequel could put them to better use, but this first entry isn't as much fun as we'd hoped. What's Hot: Sharp graphics, cute Toy Bot, some interesting puzzles, costs $3.99.